So little old me was invited to a blogger event at Paperchase Manchester and O.M.G I had such a good time. Paperchase is one of my favourite stores and always have to pop in whenever I’m in town. Of course I was excited to go as it gave me the excuse to spend!! 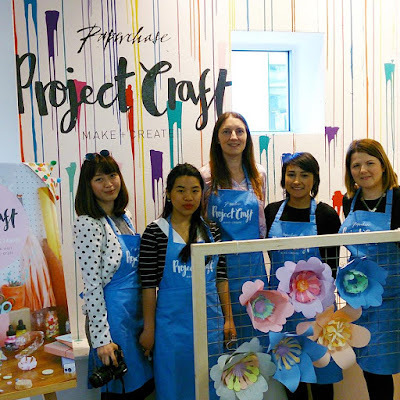 I was invited to the scrapbooking and paper flower workshops and they were both so much fun. Out of the two I think the scrapbooking was my favourite but they were both so good. The scrapbooking would fit into what I love doing but the possibilities of the paper flowers are endless. I can see a lot of paper cuts coming my way as I try different flowers at home. Overall I would highly recommend these to anyone even if you have never done anything like this before. It was so much fun and a great way to meet new people. Whilst at the event I got to meet the lovely Geraldine Jayne. I have been following her blog and YouTube for a while and she is such a genuinely nice lady so go check her out. Massive thank you to Paperchase for inviting me and I really hope the workshops are a success as I would like to attend more in the future. Would you be interested? Let me know!